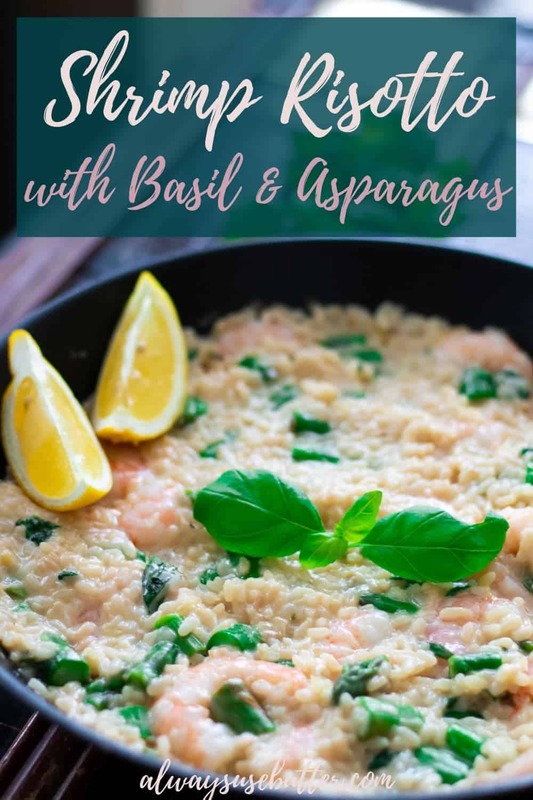 This Shrimp Risotto with Asparagus & Basil is so packed with flavor and quick and easy to make. Done in under 40 minutes, it’s the perfect decadent weekend dish. Have you made risotto before? Maybe you tried my Creamy Truffled Mushroom Risotto? Or maybe you’re still a bit intimidated by the process behind making a risotto? I know, it can seem daunting. I didn’t even dare try my hands at it for a long time. But then I did, and quickly realized I really had nothing to be afraid off. Making risotto isn’t that hard at all – you just need to keep a few things in mind. In my book, there are three secrets to making your risotto stand out: using a good wine, cooking it slowly, and not cooking it to long. While you could use a simple cooking wine, I suggest not. Instead, I suggest using something you would actually drink. At least a decent wine – but even better, a really good one. When I’m making risotto for a special occasion I like to use the same wine in the dish as for drinking – this makes for a perfect pairing of the flavors. 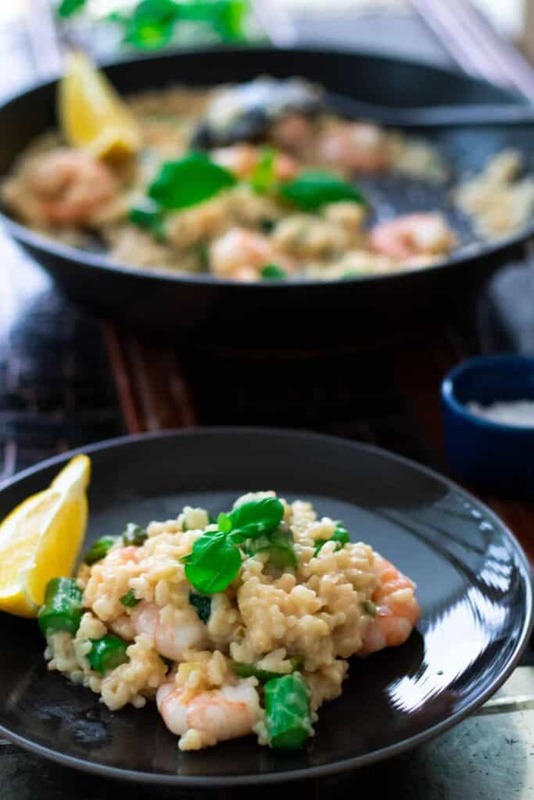 With this Shrimp Risotto I love drinking a Sancerre – so therefore, I’d use a Sancerre in the dish as well. My sister thought I was mad when I did this and called it a waste of good wine, but to me, it’s just making all the more of it. You can go a bit cheaper on the wine as well, of course, but the general rule is (not all that surprisingly…) – the tastier the wine the tastier the risotto. 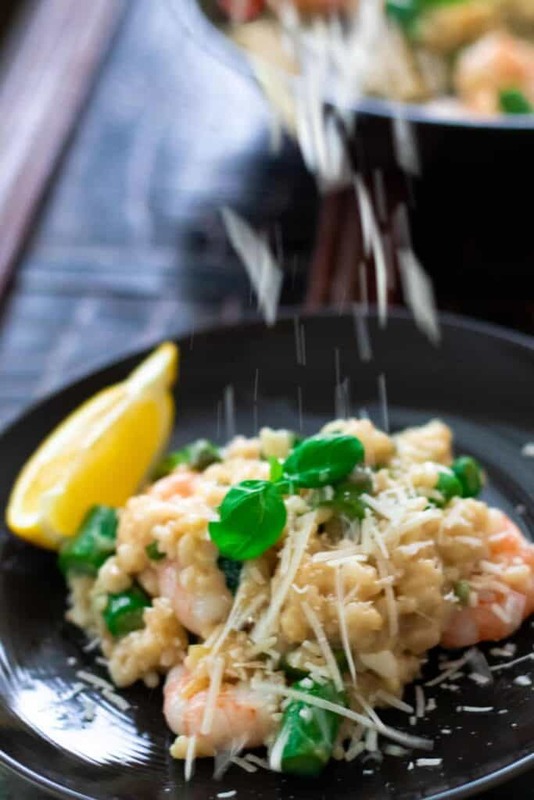 What you do instead is you cook the risotto over medium-low heat – the heat should be just high enough for it to boil, but not much higher than that. While cooking, you add the broth slowly, a little at a time. And then you stir – very carefully, but very often. When almost all the broth has been absorbed by the rice and it looks more creamy than wet – add a bit more, and repeat. And continue in this way until your risotto is cooked almost through. Now, finally, and maybe most importantly – don’t overcook your risotto. The trick here is that you have to take it off the heat before you think it’s done. Otherwise you will most likely overcook it. So, after cooking it for about 14 minutes, when you’re about to run out of stock, start tasting the rice about once every minute. When it’s finished it should still have a solid core, but not be too hard. There should just be a touch of texture left in the middle. If the rice is soft all the way through it will be overcooked. Do you have any other tips for making a perfect risotto? Help the other readers out – leave a comment below! Melt the butter in a large pan over medium-high heat. The pan should preferably be low and wide, but other pans work as well. Add in the shallots and garlic and fry until the shallots are softened, about 2 minutes. Add in the rice and fry until the butter has been absorbed by the rice, a few minutes. Make sure the heat is on high. Pour in the wine and cook until almost completely absorbed. Stir constantly. Remove the garlic cloves, add in 100 ml or about half a cup of fish stock, and stir. Place the rest of the fish stock in a separate pan over low heat to keep it wam. Lower the heat for the risotto to where it’s just simmering, and add in the rest of the fish stock slowly over the course of 16-18 minutes, adding about 100 ml or half a cup when the previously added liquid has been absorbed. Stir often, almost constantly, and carefully with a large spoon. 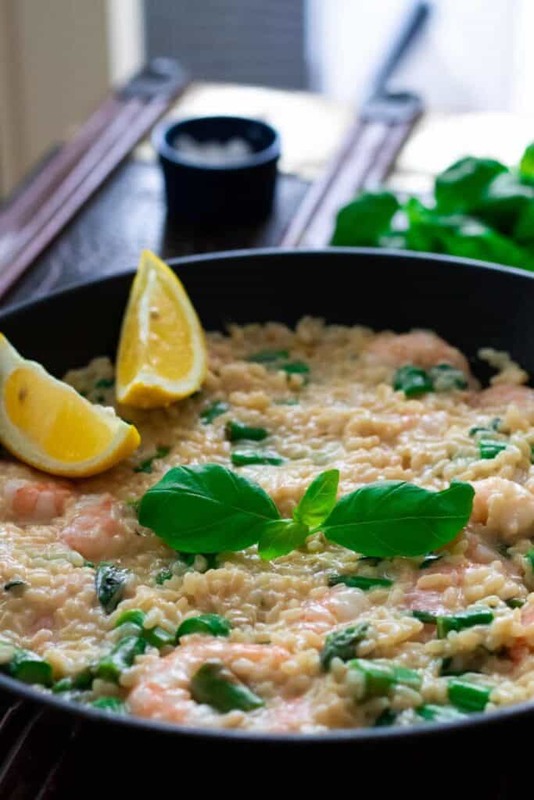 The risotto is finished when it’s cooked almost through – there should still be a solid core in the middle of the rice. 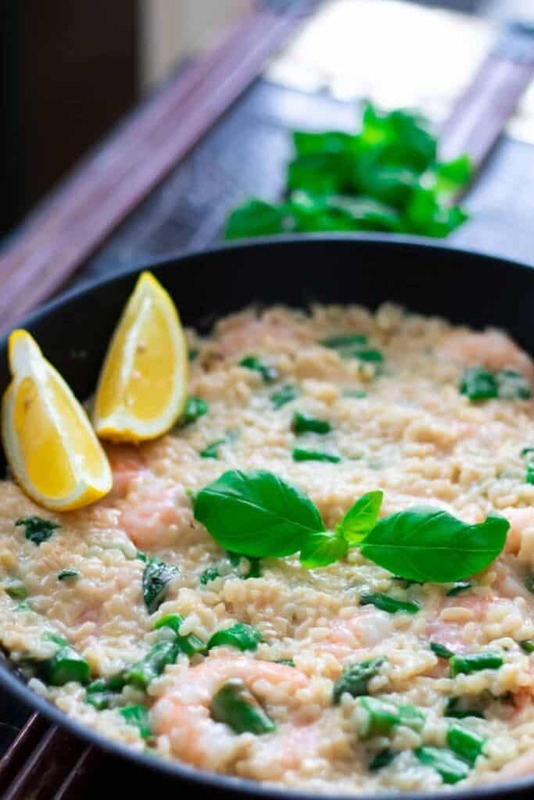 When the risotto is finished, remove the pan from the heat and mix in parmesan, lemon juice and chopped basil. Then add in the shrimp and asparagus and mix well. Let sit for a few minutes to allow the shrimp and asparagus to heat up. Add salt and pepper to taste. Serve immediately with fresh basil, extra parmesan cheese, and a lemon wedge. Bookmarking!!!! This looks sooooo yummu!!! Can we discuss how mouth-watering this looks. BUT SERIOUSLY. Yes please. And that photo of the sprinkling of the cheese, GIRL YOU got me drooling! Oh thank you so much! Drooling readers is just what I’m going for! Oh my gosh, this looks delicious! I’ll try making a plat-based version myself this week! Thank you Emily! Yes, do it! Are there good vegan subs for Parmesan cheese or what do you use? This looks super yummy and easy. Im guessing it is more on the healthy side as well. Though my family isn’t much for sea foods, I think it would be a great dish to make for my father who loves shrimp. Thanks for sharing. The presented dish looks so delicious! Thank you for your tips 😀 Must try then once. Thank you for commenting Marta! Hope it turns out great! 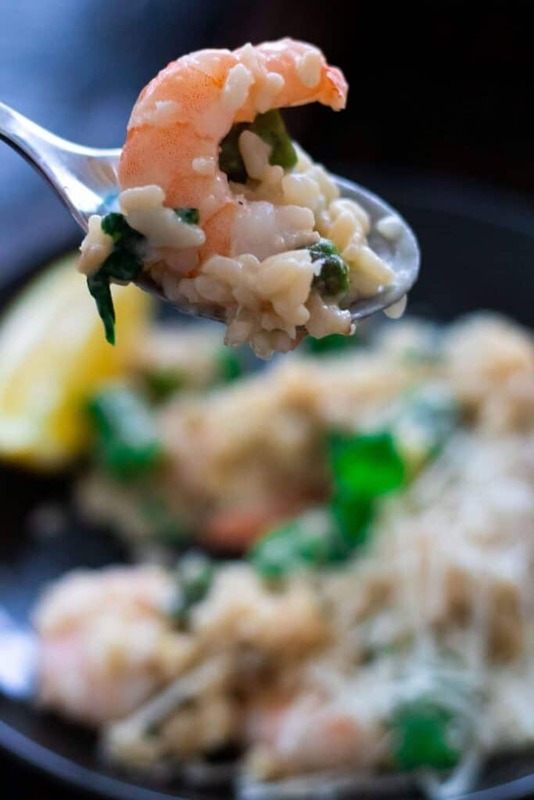 I just love how you really stepped through your key 3 tips for making a great risotto as many people do struggle with risotto generally (myself included). I am going to try this approach which I am confident will lead to a better result. Totally agree with your views on the choice of wine – it makes sense to me that better wine will produce a better taste. Also, love the look of this recipe and am looking forward to giving it a go for sure. Wow, that looks so delish, and yes i totally agree with you, a good wine gives a big role for the risotto to have it enhanced flavor. Thank you Surekha! Yeah the wine is so important! Haha, I love it! That sounds like me before I made my first risotto. Try it, I believe in you! That Risotto looks amazing. So good. 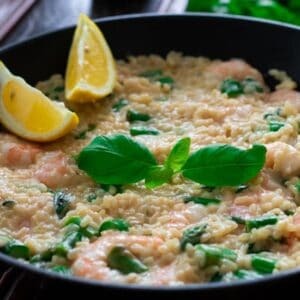 I have struggled making risotto in the past, but I want to give this one a try, I love shrimp! Thank you Melissa! Give it a try and let me know what you think! And if you have any questions about making it I am here to answer! I LOVE risotto! Basil gives so many dishes a nice taste – especially fresh basil. I wonder if I could substitute shrimp with tofu? Same here! Hm, maybe? Or just add more asparagus, or maybe some tomatoes? Oh now I want to make a vegetarian version haha! This looks wonderful. I love shrimp. Oh that’s such a great idea!! Thank you for commenting Preet! One of my favorite seafood is shrimp so this will be perfect for me. 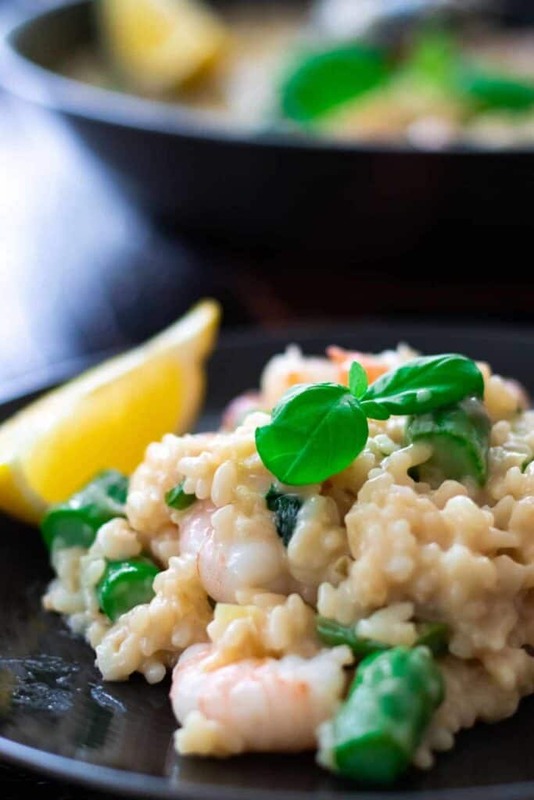 That Shrimp Risotto with Asparagus & Basil looks really tasty and flavorful! Thank you Chelle! Same here! And this such a yummy use of them! This looks yummy and I love how your instructions are so easy to follow.Def. trying this as I love shrimp and basil. Thank you so much for your comment, Becca! Happy you enjoyed the pics!